A powder applicator is a must-have for anyone using powders, like JT Eaton's diatomaceous earth powder. The design of the applicator is pretty straightforward. 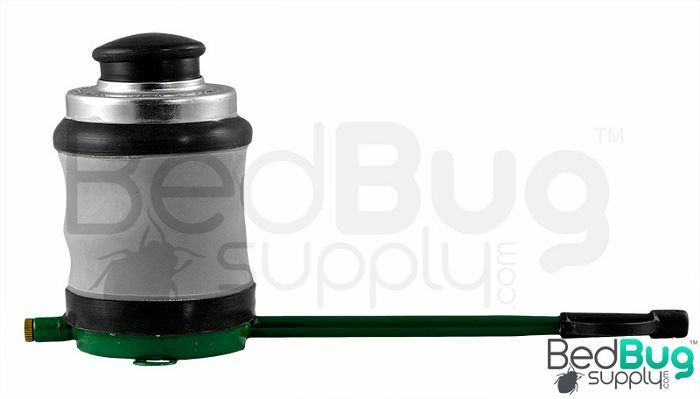 There's a spring-operated pump with a rubber filling cap that feeds into a long metal straw. The metal parts are galvanized steel and powder-coated for durability. The construction holds up; we ship out applicators every day, and have yet to hear of one breaking. An applicator should be easy to fill, easy to apply, and easy to maintain, and this one definitely delivers in all of those areas. No one should use bed bug powder without a bed bug powder applicator. 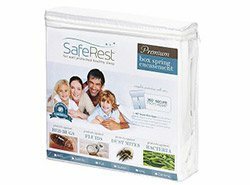 The Professional Bed Bug Powder Applicator is the perfect way to dispense bed bug powder. 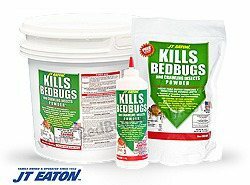 This versatile applicator can spread bed bug powder into hard to reach areas for different treatment needs. Using the professional powder applicator is key to applying bed bug powder into hard to reach cracks and crevices. When handled upright (black cap on bottom), the powder applicator creates a very fine dusting resulting in a nearly invisible barrier that bed bugs will likely not notice. When inverted (black cap on the top) the powder will flow out more freely to fill in large cracks. If you hold the applicator with the black cap sideways, it will disperse in-between. We suggest using the powder applicator outside in the grass to before using it inside to learn how to use it. Q: your ad says 'for use with our powers'. I already have powder for ants. With this work ok for diatomaceous powder? Yes, this is great for use with diatomaceous earth powder. The red and green applicators are exactly the same except for color. Many professionals like to use different colors to help identify different powders that they use. Q: Can this be used when you mix the Cimexa powder with water? Or just as a dry powder applicator? If not, what applicator should be used once the Cimexa is mixed with water? This applicator is only meant for dry powders. You can mix CimeXa with an equal weight of water in a hand-pumped sprayer. Q: How many ounces does it hold? This is hard to say because different powders will have different loose weight. Make sure to only fill the applicator about halfway so that it has room to compress. Easy to use and offers good control. A little powder goes a long way with the applicator. Reviewed by: Betty from Dolton, IL. I'm glad that I purchased this applicator. It worked great with the powder and made getting into all those tiny spaces so much easier. Reviewed by: Valerie from Lancaster, KY. I am very satisfied with your product!! 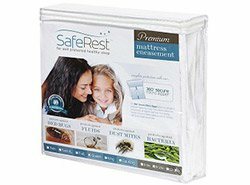 Reviewed by: shinya hoffner from New Brunswick, NJ. It works quite easily. The instructions need to day that the first puff is a large one. Green Professional Powder Applicator For Hard To Reach Areas: In the past I've used plastic containers for mustard and ketchup...they worked but not as easy as you thought. Then I found the Powder Applicator from "BedBug Supply...WOW....it works, easily and effectively. Thank you so much. The applicator is great for hard to reach areas. You have to be careful not to squeeze it to hard or too much powder will come out and it will blow back in your face. Reviewed by: Sharon Smith from Los Angeles, CA. Reviewed by: gc from tn. Reviewed by: Susanna from Los Angeles. This applicator creates a fine dusting which I could not achieve using a feather duster or a paint brush. Works great....a must-have when using powders. Reviewed by: Allen from New York. Reviewed by: Suzanne bailey from Woodhaven.